In the mid-price range, the Ideal Jessica Dressage Saddle is a true winner. 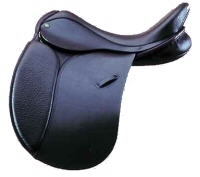 It is a comfortable, affordable and functional Dressage saddle and is a firm favourite with both riders and the equestrian trade alike, this makes it one of the most respected dressage saddles on the market. It has a semi deep seat on an open head tree with a wide centre channel and the large panels give an even bearing surface. It is ideally suited to the broader, curvier back such as Welsh, ID etc., and is not really suitable for narrow or high withered horses. You can now advertise your own Saddle on the Dressage On A Budget website. Just £5 until your saddle sells - no time limit - no further charges. Simply go to our Advert page and enter your advert details. You can even upload a photo.